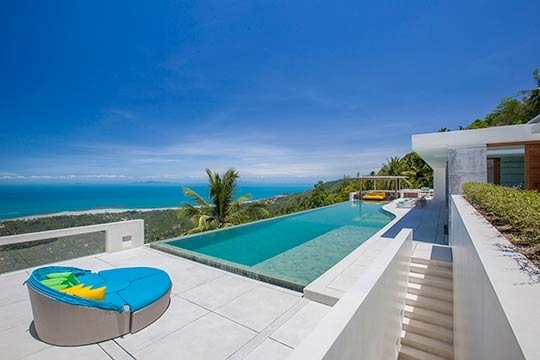 Lime Samui 2 soars above Koh Samui’s west coast offering jaw-dropping island and ocean views. 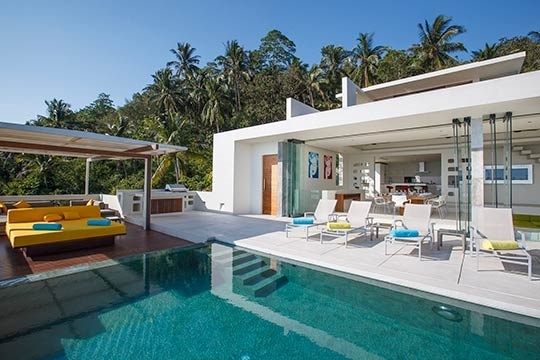 With its 22m infinity pool, home cinema, gym, massage and games room, this superbly designed, fresh and modern 5-bedroom villa with excellent staff team is so well equipped guests will neither want, nor need, to leave. 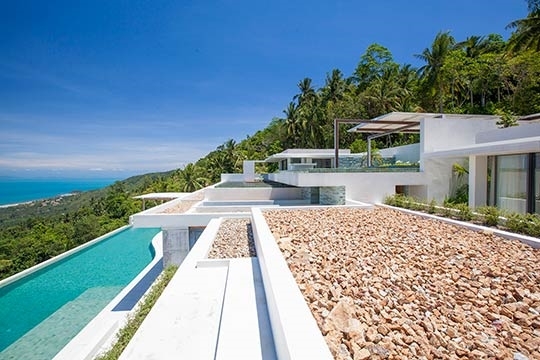 Anticipation builds as you drive ever higher up a jungle-swathed hillside above Koh Samui’s west coast, but the view that greets you from Lime Samui 2’s entrance exceeds all expectations. 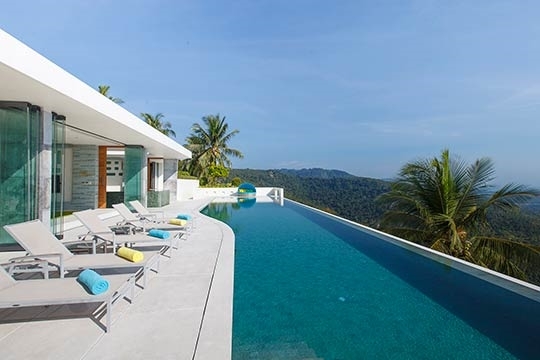 From this highest of the villa’s four levels, steps lead down between shimmering roof-top water features to the 22m infinity swimming pool, beyond which lie lush green hillsides and the ocean stretching towards the mainland, some 32km distant. 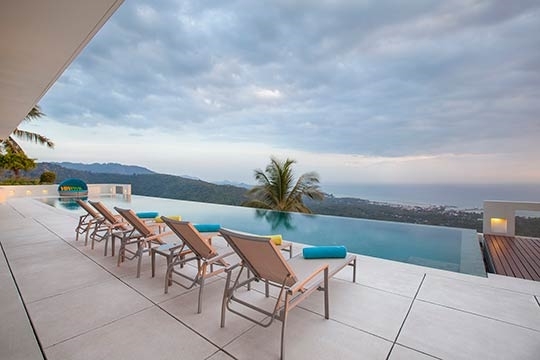 The villa itself is as impressive as its views. 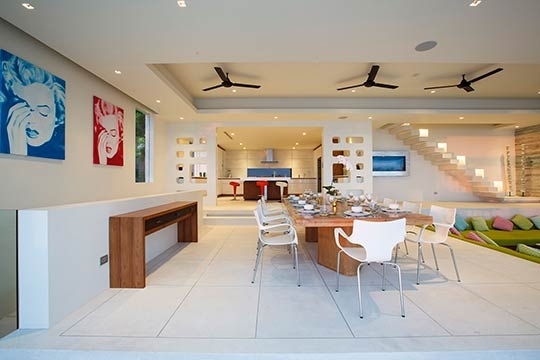 Its modern design is attractive, welcoming and practical. 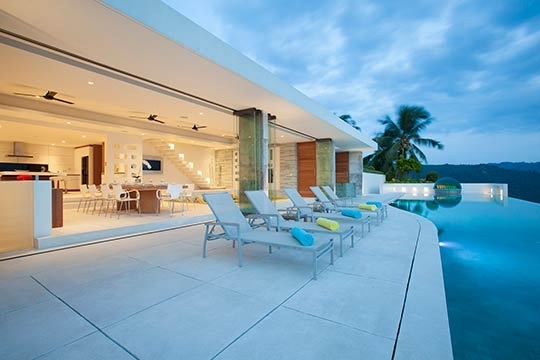 Virtually every room faces the ocean and captures the cooling breezes, and many boast their own private balconies. 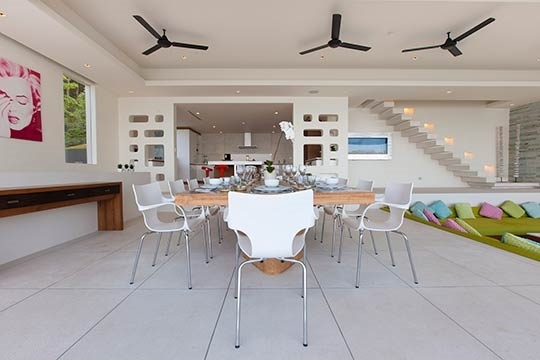 Creamy sand-washed floors and soothing green-stone walls defy you not to relax. 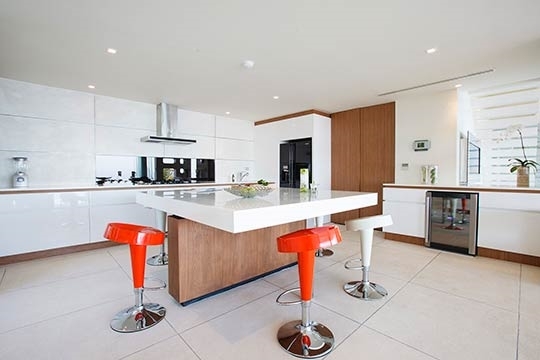 Bright, simply furnished interiors are complemented by crisp, fresh colours and modern prints. 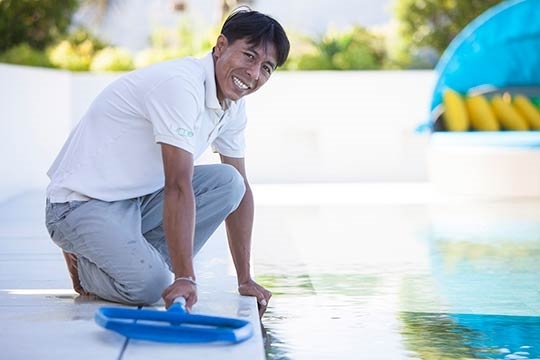 Attention to detail at Lime Samui is second to none; from the delicious fragrances that drift through the rooms to the thoughtful provision of operating instructions for the villa’s impressive array of facilities. 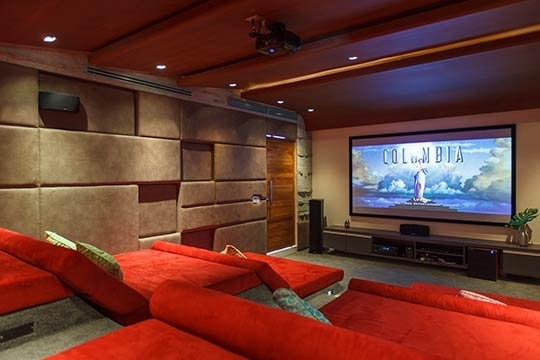 The luxurious home cinema features a state-of-the-art entertainment system providing 100s of movies (including 3D and Blu Ray), and thousands of tunes can be piped through the villa on the Sonos sound system – even in the pool! 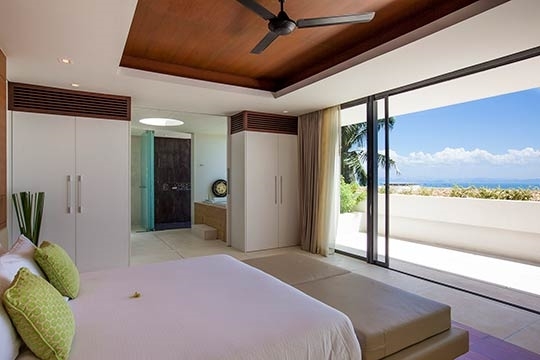 The spacious bedrooms are tastefully presented and offer plenty of privacy, while the bright kids room (which could also comfortably accommodate a family of four or more) gives the villa extra flexibility. 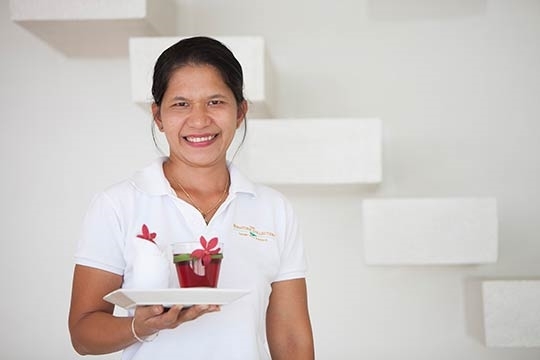 Polished service is provided by a caring team of staff who serve a complimentary breakfast every morning and tend – almost telepathically - to guests needs throughout the day. 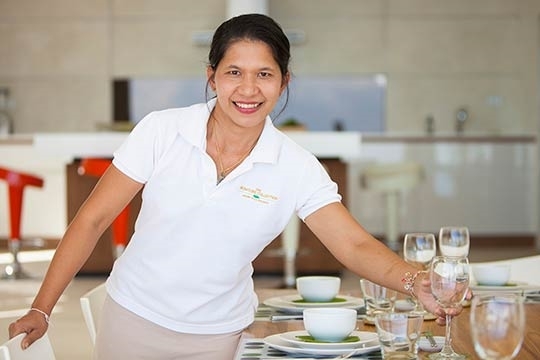 Other meals can be selected from a suggestion menu and cooked by the villa’s chef with guests paying only for ingredients plus a 15% service charge. 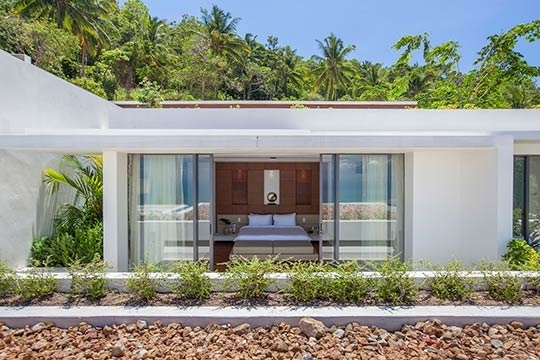 Lime Samui’s excellent facilities, beautiful location and superb service make it unlikely that you will want to venture out, but if a day on the beach is called for, Lipa Noi and Sunday brunch at The Nikki Beach Club are recommended. 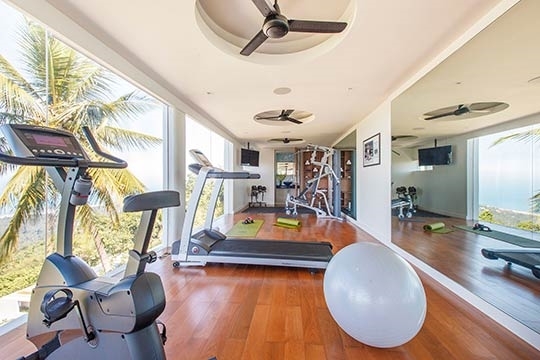 With views, service & facilities like this you'll never want, or need, to leave. Where to start? 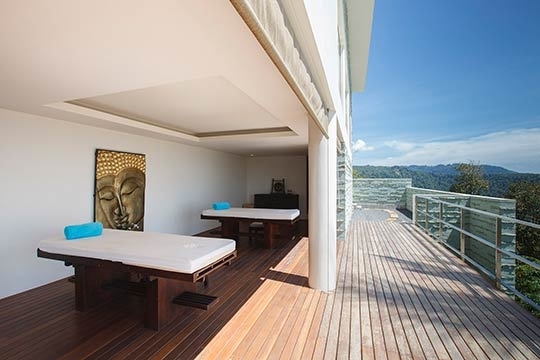 We’re suckers for a view, and the one from Lime Samui is definitely in our all-time Top 10. 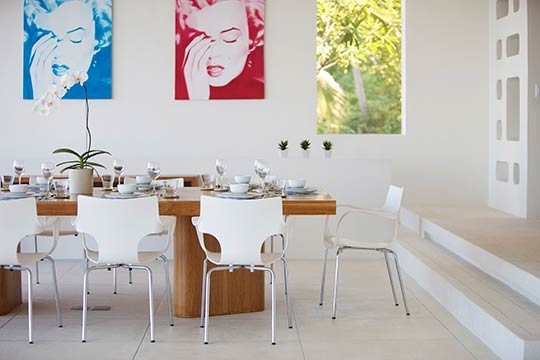 Meals were perfectly cooked and presented; staff were gracious and thoughtful and the villa’s facilities are 5-star. 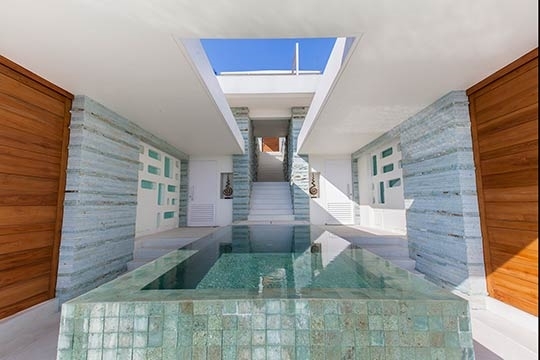 Sadly (for some), this may not be the villa to bring grandma and grandpa to, as there are a lot of stairs to negotiate. Equally, families with very young children may not be 100% comfortable with all the stairs. But older kids and mums and dads will love it here. 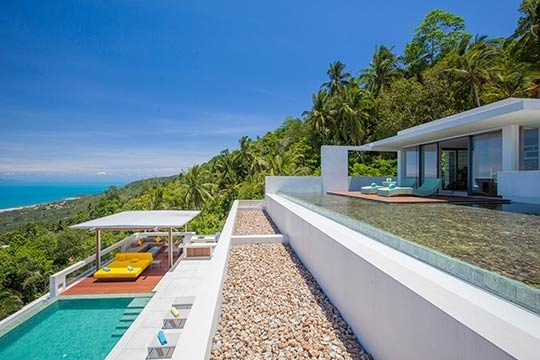 Lime Samui 2 is at the top of a steep road that winds up through lush jungle-clad hillside. 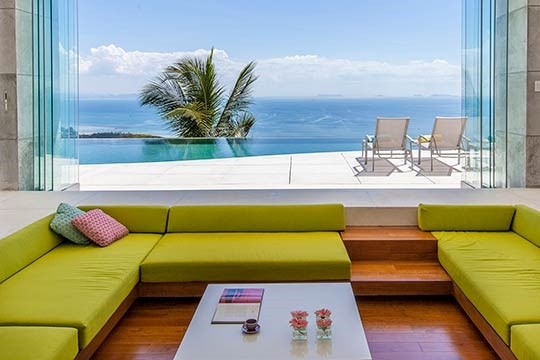 At the time of our inspection (December 2012) only one other villa (Lime Samui 4) occupied this area, so space and privacy is supreme and views are spectacular. A car and driver is essential for anyone wishing to explore beyond the villa grounds. The nearest town is Nathon, which lies about three kilometres below on the coast and offers an interesting insight into local island life. 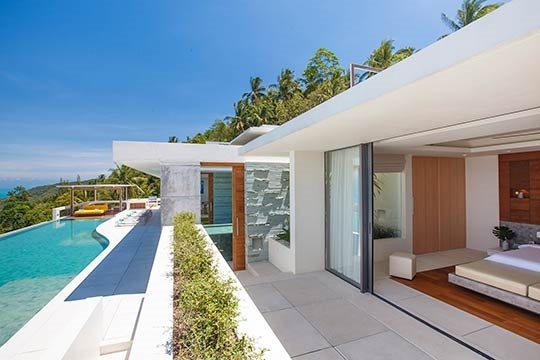 The tourist centres of Bo Phut and Chaweng, and Samui international airport lie some 20-25km around the headland to the north east. 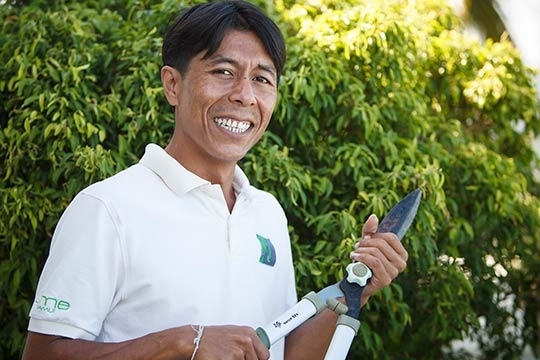 Nathon is the island's administrative centre, main port and sea gateway located on the north-west coast, where car and passenger ferries sail between the Thai Mainland province of Suratthani an hour and a half away. 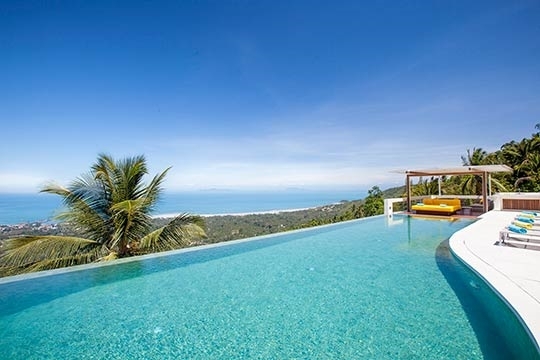 It is also the jumping off point for the islands of Koh Tao which is known for some of the best scuba diving in the Gulf of Siam, and Koh Phangan better known as Full Moon Island for its monthly beach parties. A monthly migration of party-going backpackers and tourists has produced a profusion of sarong shops, clothing boutiques, bakeries, second hand bookshops, travel agents and internet cafes which have sprung up along the waterfront and main thoroughfare making it a lively spot for browsing. Major supermarkets such as Tesco Lotus also provide international shopping for the adjoining districts of Lipa Noi and Laem Noi. Of special interest for visitors are the charming rows of old Chinese shop houses along the middle street which bear witness to the town's exotic history as a strategic trading port and which now sell an eclectic range of unusual goods. Dining at any of the waterfront seafood restaurants one can experience a taste of truly authentic and spicy, local cuisine, while the weekly 'walking street market' has become something of an attraction for the town with its myriad vendors selling local and international delicacies and goods. 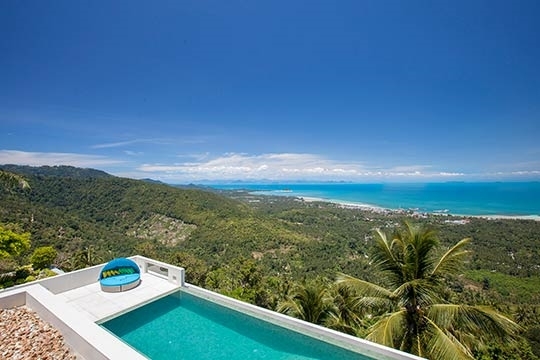 Set in the lush green hills behind Nathon, many beautiful villas and condominiums enjoy some of the most beautiful views of the outlying islands and Thai Mainland in the distance, and some of the most spectacular sunsets. 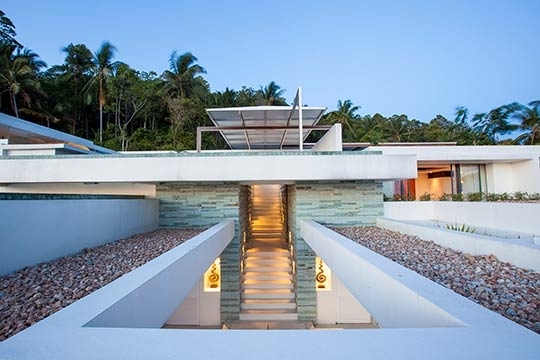 From Lime Samui’s top-level entrance a flight of cream sand-washed steps descend towards the pool. 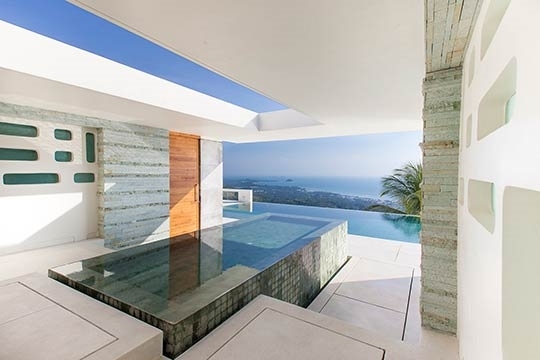 Half way down on the left a king-bedded master suite faces the ocean through wide glass doors. 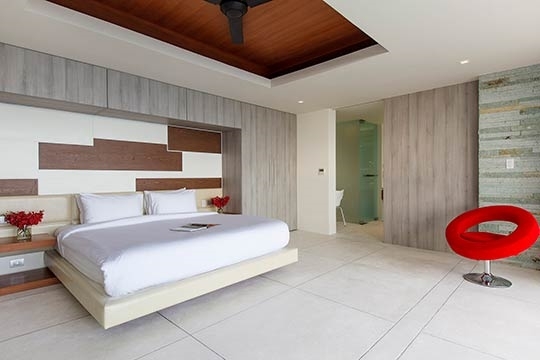 The room is equipped with a 40-inch TV and has an abundance of fitted storage space. 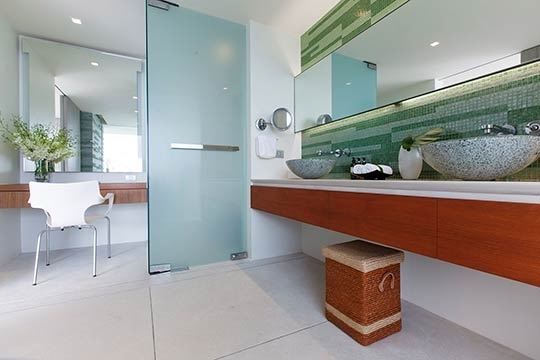 A large ensuite bathroom features twin washbasins, separate wc and shower cubicles, and a jacuzzi tub – with a view. 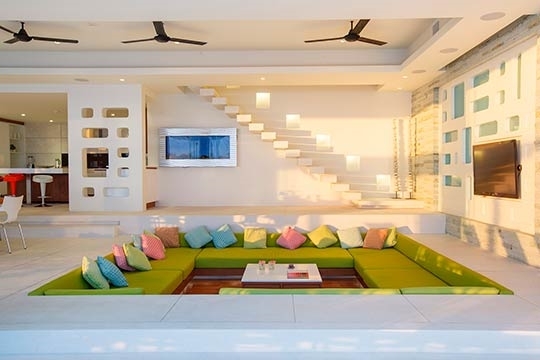 A few steps further down towards the main living area is a second master suite, almost identical to the first. 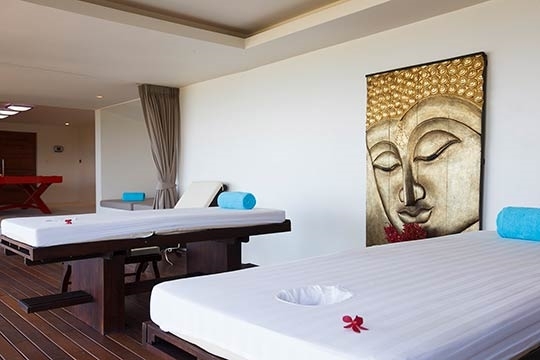 This room is positioned just above the 22m infinity pool, which stretches across the front of the villa. 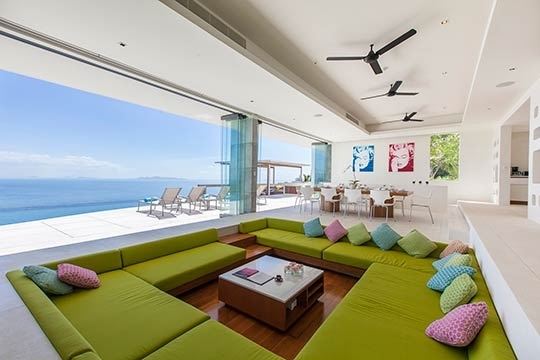 Colourful sun loungers face the water while a barbecue area and a shaded outdoor lounge are arranged at the far end. 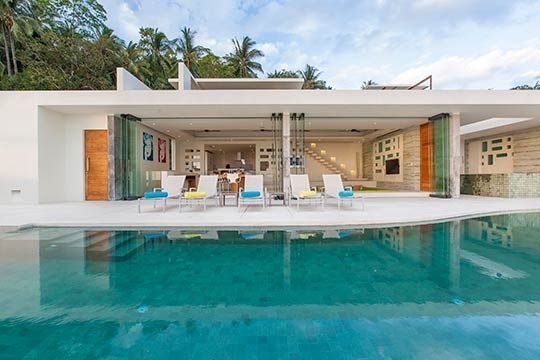 From the pool deck, glass panels fold back to reveal the super-cool sunken lounge (with lime-green sofa seating for 20), the dining area and the well-equipped kitchen. 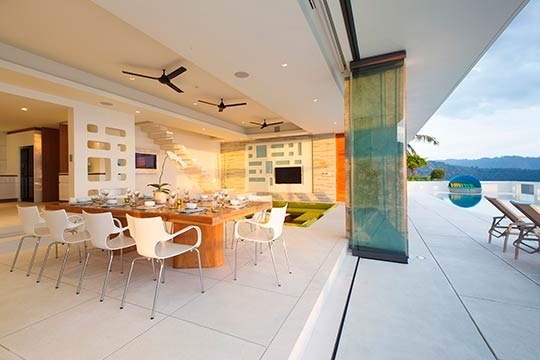 To one end of the living area a 54-inch 3D TV is mounted on a feature wall of green stone, a framed aquarium is set into the rear wall and ‘floating’ steps lead up to an office with computer for guest use. 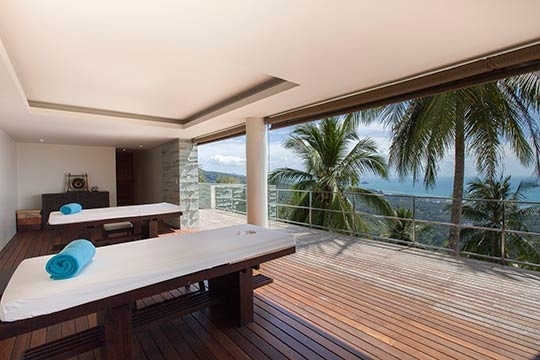 Doors from the office open to a furnished terrace with arguably the best view in the house. 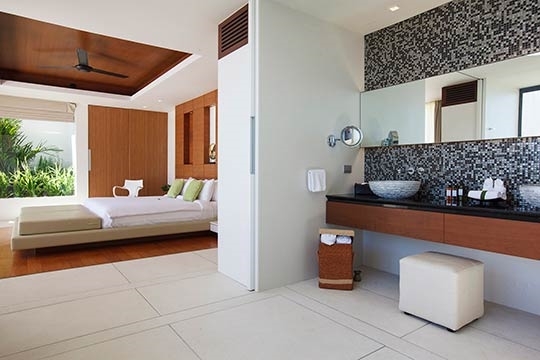 Stairs descend from the living level to two further king-bedded guest bedrooms which are similarly styled to the masters. 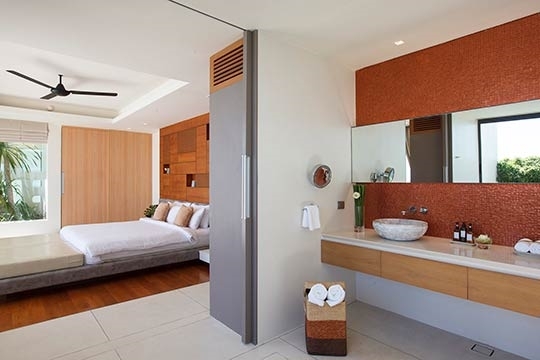 The ensuite bathrooms, while still extremely spacious, are shower only. 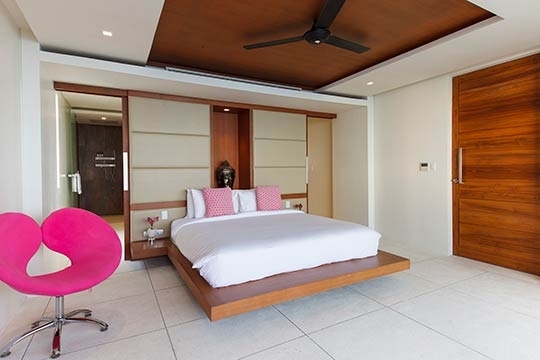 A final flight of steps leads to the fifth bedroom, where two queen beds and two single beds on a mezzanine level, make a great kids dorm or a useful family room. 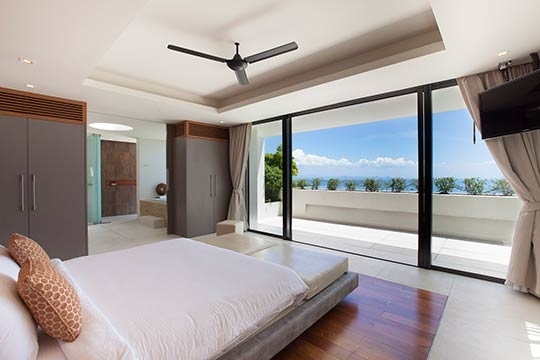 This is the only bedroom without ocean views, although a large picture window looks out onto the hillside and keeps the room bright. 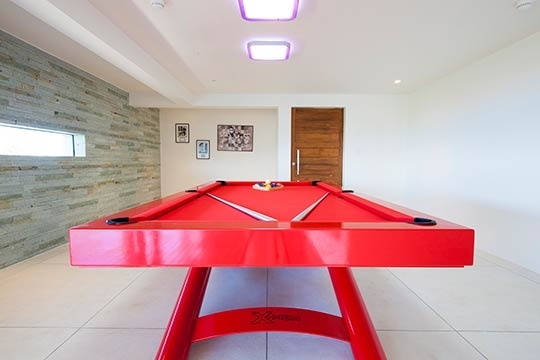 Across the hallway from the kids room is the open-fronted games and massage area, furnished with bright red pool table and two professional massage beds. 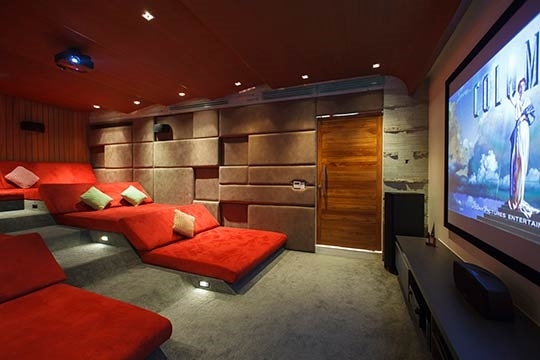 Above this is a yoga deck and gym (well equipped with a range of Life Fitness machines) and half a flight further up is the splendid home theatre, where three levels of red suede sofas face a 2.5m movie screen in air-conditioned comfort. 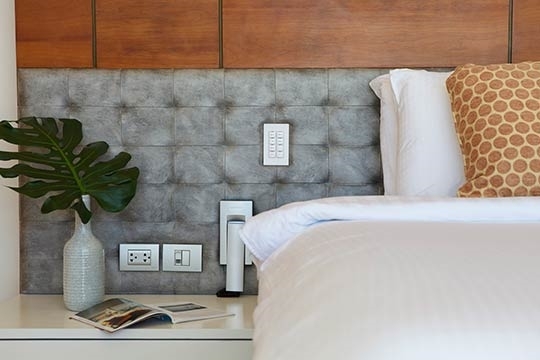 Limited Time – Enjoy 20% off Book by 31st May for stays from 1st April to 30th June 2019 and receive 20% discount. 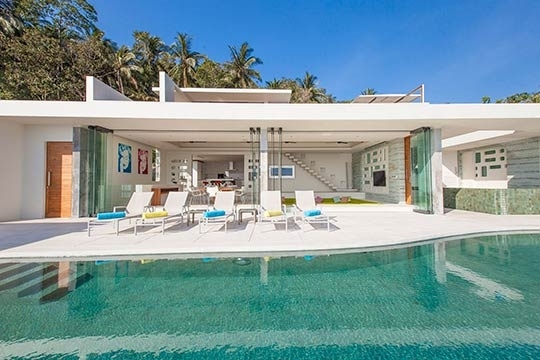 5 bedroom villa located in Nathon, Koh Samui. 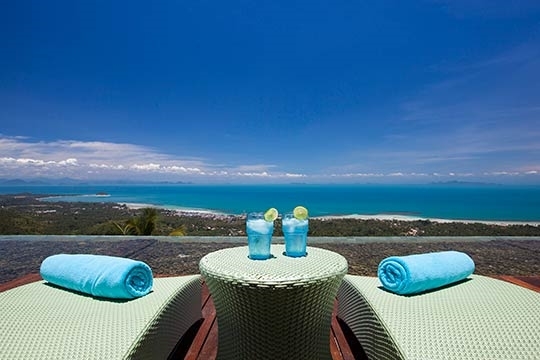 Ideal for Body and soul, Bring the relatives, Executive escape, Gastronomic delights, Going for golf, Fair share for groups, Private island hideaway, Party pads, Spa sensation, Room with a view, Perfect for weddings.